"I like to be embarrassed," said server Jordan of being photographed with the Zombie on the Beach ($10). Ever since Sneakers Bistro opened in 1980, Winooski has been a brunch force that belies the city's mini size. In recent years, Our House Bistro, McKee's Pub & Grill and Misery Loves Co. have made the Onion City the place to be for eggs in the afternoon. 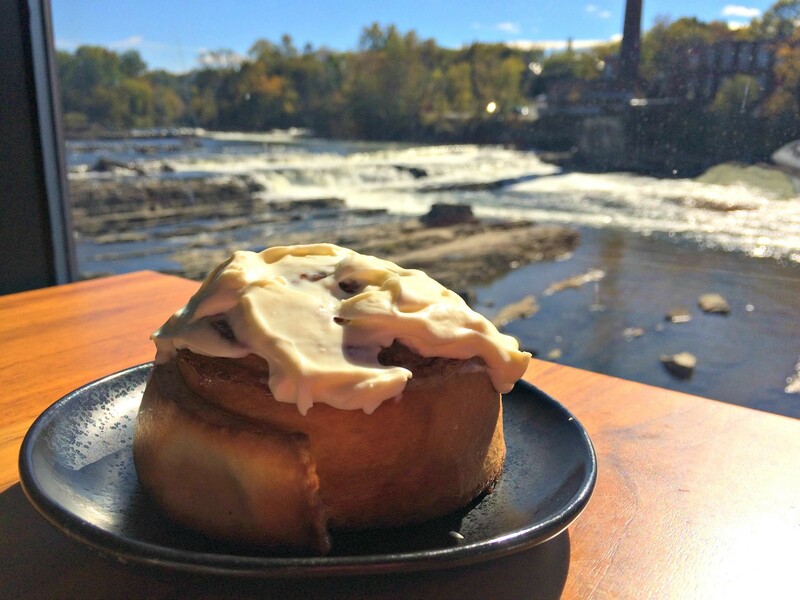 The reborn Waterworks Food + Drink began serving a brunch of its own over the summer, with blue skies over Winooski Falls as its primary attraction. 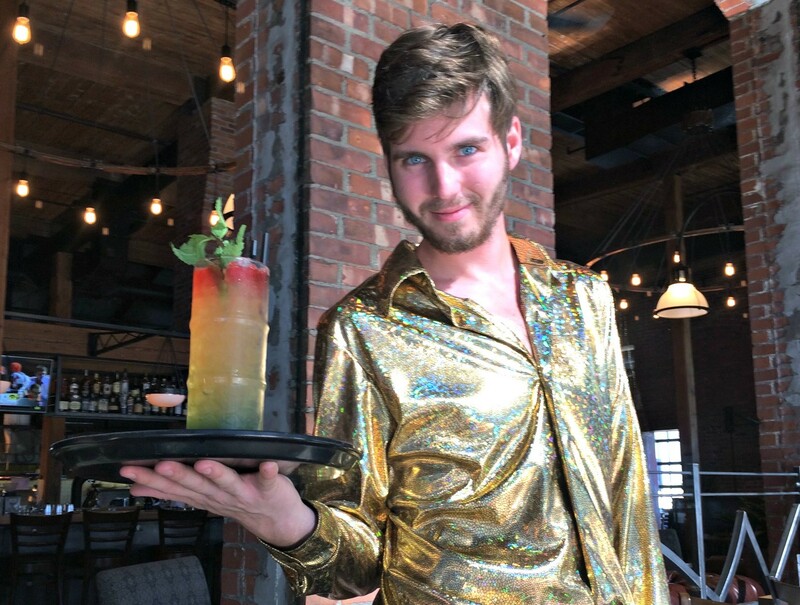 Last month, Outright Vermont and DJ Craig Mitchell staged a Disco Brunch to kick off Pride Week with music and an indulgent meal. It was back last Saturday, complete with spangled servers and 10 percent of the meal's proceeds going to Outright. My waiter, Jordan, committed to the concept better than anyone else. And to match his stardust extravagance, we couldn't resist ordering the menu's most colorful cocktail. The Zombie on the Beach was a true rainbow, starting with blue and indigo at the bottom and graduating to a strawberry-flavored red. The yellow-orange in the center was a classic Zombie, floating amid the varied fruit flavors. In all, the drink utilized four different types of rum for a result that mimicked an incredibly sophisticated multi-strata Slush Puppie. It would take a stronger woman than me to forgo ordering a housemade cinnamon roll. This version was firmer than would have been ideal, which made it difficult to cut and share among my party. Oh well; next time there will be no sharing. Despite the thick slather of hard sauce on top, the aromatic pastry wasn't overwhelmingly sweet. 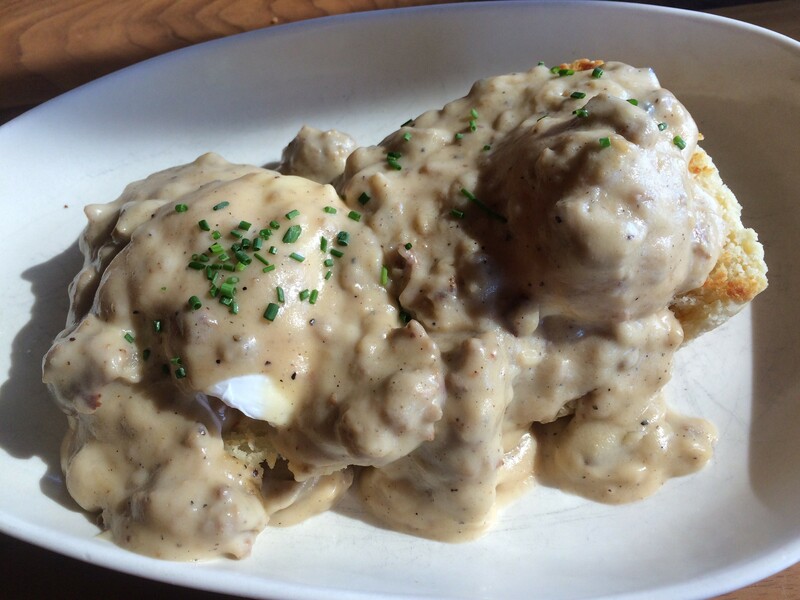 The menu included no mention of poached eggs on the biscuits and gravy, which made the runny yolks a tantalizing surprise. Atop pillowy biscuits that flaked apart into buttery layers, the peppery gravy held both chunks and slices of sausage, creating a different texture with each bite. 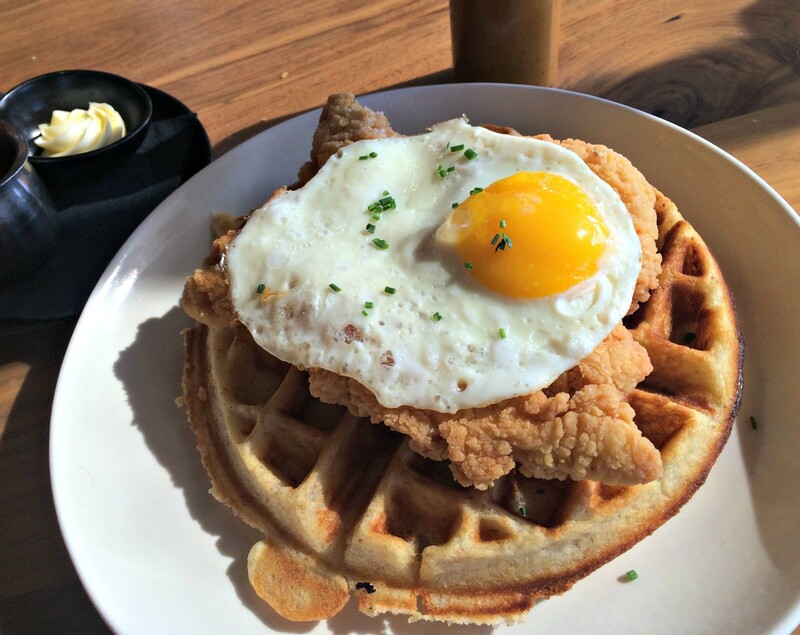 Just as the poached eggs oozed forth as if they were taking a test in the subject, the sunny-side-up egg on the chicken and waffles was cooked to perfection. The dish's titular bird, however, was dried out nearly beyond recognition. But with house hot sauce to slather over it, I didn't really mind. Manager David Logan told me that the deep-orange sauce will be available for sale soon, and I will be purchasing a bottle for its light burn flavored with vinegar and cumin. Did it pair well with the fluffy, crisp-edged waffle that I drenched in maple syrup? Well enough. But I didn't really question whether the combo made sense. I was enjoying the individual elements, the tunes and the view more than enough to concern myself with culinary soul-searching.